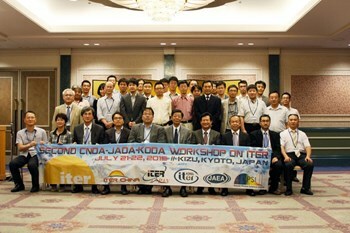 A second trilateral workshop on ITER—organized by the Domestic Agencies of China, Japan and Korea in July—was the occasion to exchange on the experience of manufacturing ITER components and collaborating together for the success of the project. A second trilateral workshop on ITER was successfully conducted on 20-22 July, with approximately 40 participants from China, Japan, and Korea at the Kansai Photon Science Institute of the Japan Atomic Energy Agency in Kizu (Kyoto), Japan. The workshop not only aimed at the exchange of experience regarding technology and manufacturing of the ITER components, but also aimed at supporting the Central Team of the ITER Organization through close collaboration among the three Domestic Agencies for the success of the ITER Project. A team-building dinner party was held at the start of the workshop with the participation of government representatives, who strongly encouraged further constructive collaboration between the three countries to promote and advance the ITER Project as planned. During the ensuing technical discussions, each Domestic Agency head provided a report on procurement achievements since the first workshop last year; this was followed by presentations and discussions on 15 action items concerning technical and quality assurance/quality control (QA/QC) issues in ITER components such as the blanket, divertor, Test Blanket Modules, magnets, the vacuum vessel, and diagnostics. The discussions were prepared in advance of the workshop through the close communication of technical responsible officers. As a result of the workshop, the three Domestic Agencies have established a common proposal on QA/QC issues that they will submit to the ITER Organization Central Team, in view of enhancing relations as a single team. Technical collaboration among the three Domestic Agencies will also continue to prepare for the 3rd China-Japan-Korea workshop to be held in Korea in 2016.